If you’re unlucky enough to suffer a delayed flight, the good news is you may be due €250 up to €600 in compensation from the offending airline. In line with EU regulations, if the airline itself is responsible for the disruption, and you’ve been delayed for 3 or more hours, the minimum entitlement is €250 per passenger. What are my rights when a flight is delayed? When do I receive compensation for flight delays? 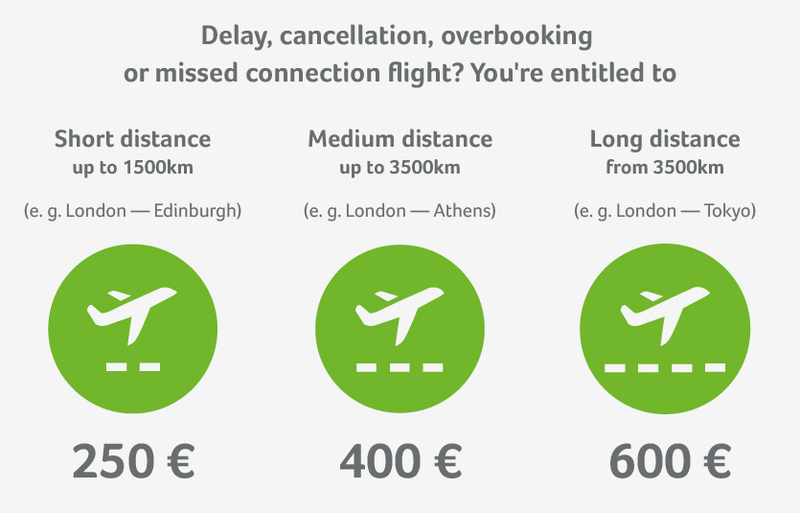 Note: The cost of the ticket has no relevance to the total amount of compensation, and as such you will be able to claim on flights with low-cost airlines. It is also possible to claim on flights as far back as 6 years. However, for your claim to be eligible for compensation, the flight must depart within the EU or, if it lands in the EU the airline must have its headquarters in the EU. What counts as arrival time? It is important to remember that delays are calculated based on the time of arrival, and not the time of departure. But, what exactly defines a flight’s “arrival time”? In September 2014, the European Court of Justice (case) defined "arrival time" as the moment when the aircraft reaches its final destination and at least one of its doors opens. This is based on the assumption that this is the moment the passengers are permitted to disembark. What if I am delayed as a business traveller? If you suffered a flight delay as a business traveller it will be you who receives the compensation, not your employer. Likewise, if you’re travelling as a state official, the regulation deems it that you’ll be the one entitled to recompense from the airline. It is the person who suffered the inconvenience of being delayed that receives the compensation - not whoever paid for the ticket. This stands regardless of the price of the ticket. How do I apply for compensation if my flight is delayed? The first thing to do is to confirm that you are actually eligible for compensation. This is often not a simple process: getting access to flight databases, comparing your situation with other similar cases, checking whether your case applies under European Regulation No. 261/2004 etc. In fact, for an individual without the legal expertise or the required technology, this can prove quite complicated. If you qualify for compensation for your flight delay, you can immediately instruct us to begin asserting your rights. Our network of European experts and our international experience allow us to negotiate on an equal footing with airlines. We do not hesitate to take the matter to court where necessary. In 98% of cases where legal proceedings were required, our clients won their case. Regardless of the outcome, we assume all the financial risk. If we fail to succeed with your case, for whatever reason, we are the only ones to bear the costs. When we do win, we take a fee of 25% (+ VAT) of the amount recovered. This protects you, as the customer, from any expense and lost investment. Many airlines neglect to inform their passengers of their rights in the event of delayed flights. A common tactic is to ignore their customers completely. Alternatively, they offer passengers cheap vouchers that do not come close to the amount they are actually entitled to, and then get them to sign a declaration in which they end up waiving all other rights against the airline. The airline takes the risk that affected passengers will not really understand their rights, or will get frustrated with repeated attempts to enforce them. This is something that Flightright refuses to accept. We help passengers enforce their rights and allow them to finally have their voices heard. Which passenger rights do I have at the airport when my flight is delayed? If your flight is delayed for more than 5 hours, you can opt out of your flight and the airline will be obliged to refund you the price of your ticket. Alternatively, you have the right to ask the airline to arrange the quickest possible alternative form of transportation. The airline may also transfer you back to your original departure point, for example, if you have missed a business meeting due to a missed connecting flight, you entitled to getting a transfer back to your original departure point. If the departure is postponed until the following day, you can take advantage of a night's accommodation and return transportation from the airport. Usually, airlines organise the overnight stay and transfers themselves, and inform you of the planned arrangements. Before you decide to book something yourself, it is always best to check directly with the airline. Also make sure that you get a written confirmation of all communication if the airline offers to reimburse for accommodation you found yourself. What are “extraordinary circumstances” in cases of flight delay? There are exceptions to the rule - for example if it is shown that the airline could have avoided the problem by taking reasonable measures, it will be liable for the delay of the aircraft. An instance of this would be if the airline cited bad weather conditions, and what actually happened was they failed to ensure that there were sufficient supplies of de-icer before the onset of winter. In this case they may be deemed responsible for the delay - especially if flights operated by other airlines were able to depart on time. You might be entitled to compensation from €250 to €600 if you arrive at your destination 3 or more than 3 hours later than planned. The airline is responsible for the delay (e.g. technical fault or sick crew).